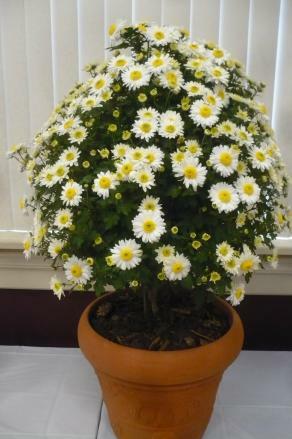 After a year of preparation, the 2010 show of the Long Island Chrysanthemum Society took place in the Henry Hicks Education Center of Hicks Nurseries in Westbury, New York on the weekend of 16 and 17 October. 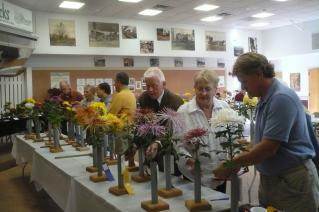 The show was set up on Friday, 15 October, and judging took place on Saturday morning. The show was open to the public on Saturday afternoon and all day Sunday, and the awards ceremony and dismantling occurred on Sunday afternoon. The show was a success thanks to the twelve exhibitors who worked long and hard through the growing season to prepare the beautiful flowers which comprised the one-hundred and nine entries and a large special exhibit, the judges who made the long drive from New Jersey to adjudicate the show, and the "Show Committee" and other members who shared their expertise and precious time to make the show run like a well-oiled machine. Of course we also thank the members of the public who took the time to enjoy our show. I became show chairman when President John Capobianco became a candidate for the New York State Assembly and asked to delegate the responsibility to me as LICS Vice-President. Previously I had run a music festival for hundreds of students, and conducted a small community orchestra for twenty-five years. 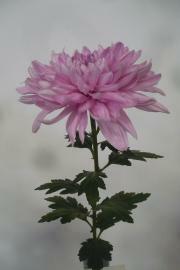 Although I had only been growing chrysanthemums myself for a few years, I grew up with "mums" as the son of Sidney and Debby Simon, nationally known amateur growers, and attended many of the fifty-five previous shows. 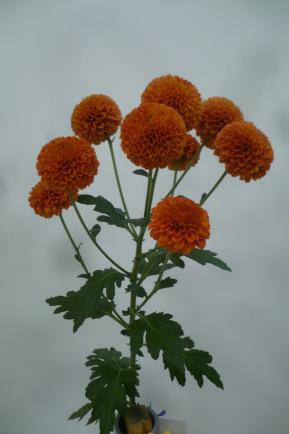 In my father's last year, I helped him to grow his mums and enter them in the 2004 show, getting a crash course in the fine points of Chrysanthemum indicum. However, the real reason for the show's success was due to the fine people who worked with me. First of all, John Capobianco continued to help us in many ways behind the scenes, and his spectacular bonsai exhibit was a highlight of the show. Most of all, the members and Show Committee worked very hard individually and worked well together. The Show Committee included the following: Chairperson, Joel R. Simon; Awards, Joan H. Corbisiero; Classification and Show Schedule, Richard Heeseler; Clerks, Renu Sharma; Judges, Richard Murcott; Placement, Pam MacCormack; Program and Printing, Thora Heeseler; and Tabulation, Thomas Lavan. John Sokol printed and distributed fine show posters, and donated beautiful chrysanthemum photos which were given away to show visitors, and his uncle, Walter Sokol, devoted hours to helping me run the show after it was opened to the public, and helped me take the photographs which are an important part of this report. Of course everyone pitched in beyond their individual responsibilities as needed, and friends and relatives were enlisted to help out as well. We were honored to have as our judges Louise Hauser, Jimmy Tan, Chuck Blewett, Miriam Willinger, and Doris Zurcher. 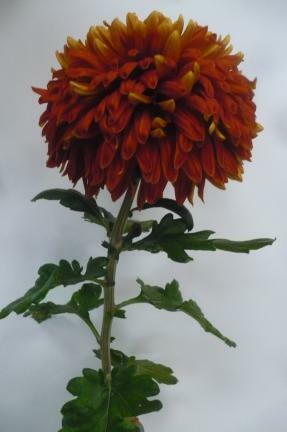 In addition to their major responsibility to adjudicate the show, they took the time to bring many fine blooms of their own (adjudicated by Long Island judges) without which the show could have been anemic indeed. 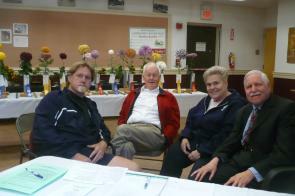 We also were honored by the presence of Bob Solstad, First Vice President of the New Jersey State Chrysanthemum Society, who came with the judges. Veteran chrysanthemum grower Herbert Elliott Jr. made the long trek from the North Fork with a carload of fine blooms, including several unique cultivars not grown this year by anyone else. 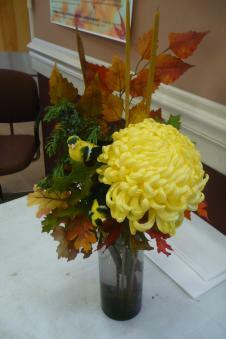 He also brought a beautiful arrangement in memory of Ted Rice, a long-time LICS member who passed on recently. 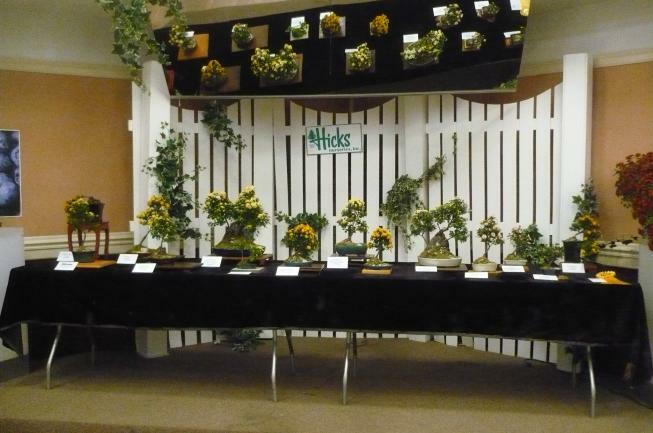 If our members and judges provided the plot of the drama, the fine folks of Hicks Nurseries provided the beautiful setting, without which the show would not have occurred. L-R: Richard Murcott, Judge Miriam Willinger, Judge Jimmy Tan, Judge Louise Hauser, Judge Doris Zurcher, & Richard Heeseler. 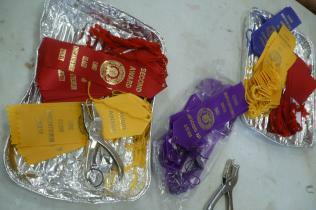 Whose entries will be awarded ribbons? 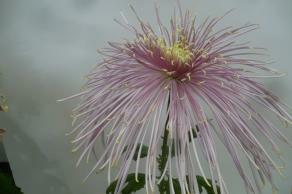 There are literally hundreds of varieties (cultivars) of chrysanthemums, grouped for exhibition purposes into thirteen classes. They may be grown as very large blooms ("disbuds") which come about by pinching off the side buds so that all the plant's energy goes into one bloom, as a group of small flowers on a single stem ("sprays"), and in other ways, such as "cascades." 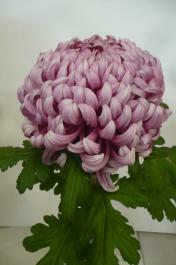 Mums may be exhibited as cut flowers (either individually or in groups of three), or as entire plants in a pot or other container. To make sense of it all, a "show schedule" is published, and the exhibitor is expected to complete an "entry card" for each submission. Arriving at the show, the exhibitor presents his or her blooms and corresponding entry cards to the classification chairperson, who, with the advice of other advanced growers, has the final word on where the entry is placed in the show. 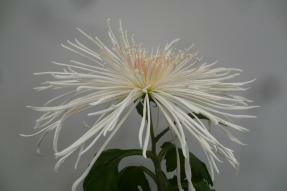 Each cut bloom is exhibited in a standard tube on a base, supplied by the society. 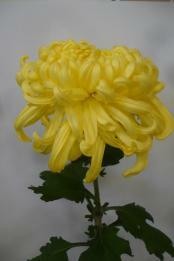 The exhibitor must be an amateur grower, and must grow his or her chrysanthemums outdoors, although temporary protection is allowed before the blooms are cut for the show. 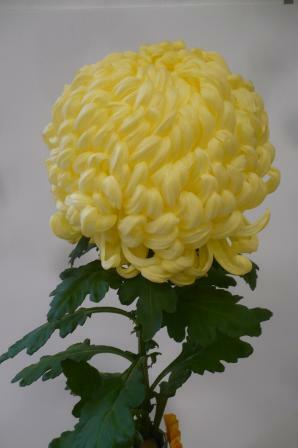 The judges are experienced and successful chrysanthemum growers who have attended a class and passed a rigorous examination, and master judges have reached an even higher level. Judges are members of other societies, and Long Island judges in turn judge at shows outside of the island. Each cultivar is considered a subclass, and blue, red, and yellow ribbons are awarded to the best blooms in each subclass. Higher awards are given to the best bloom in a section or group, etc., and these winners are in turn compared to determine best disbud, best spray, best container grown, best bonsai, etc. in the entire show. Both local awards and national certificates are presented to the best entries. Points are awarded to each entry which has won an award, and the exhibitor having the most points wins "sweepstakes." Herb's arrangement in memory of Ted Rice. We miss you, Ted! In addition to the regular entries, provision is made for special displays, defined in the show schedule as "an exhibit of at least 18 square feet that is designed to please as well as instruct." 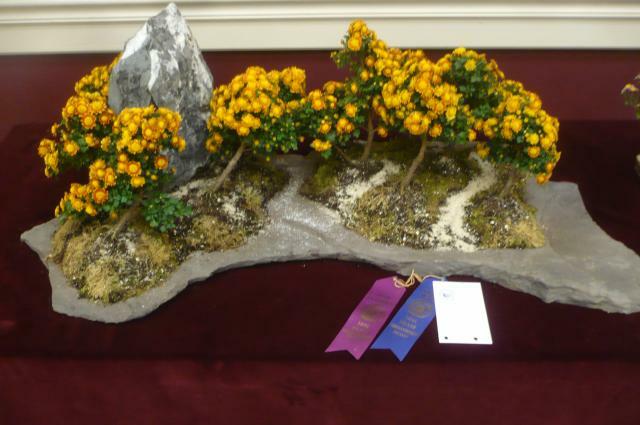 A highlight of the 2010 show was a display of bonsai by John Capobianco, for which he was awarded a National Chrysanthemum Society (NCS) Gold Medal Certificate. He also entered several more bonsai in the rest of the show. Herbert Elliott Jr. won Sweepstakes with a total of 64 points. He also earned an NCS Bronze Medal Certificate for his vase of Golden Splendor, which was the Best Vase or Basket in the show. Close behind Herb in Sweepstakes totals were Joan Corbisiero (57 points), John Capobianco (48 points), Doris Zurcher (47 points), and Jimmy Tan (28 points). The Best Disbud in Show, which also was the Best Disbud, Section A and Best Incurve, was a magnificent Primrose Mt. Shasta exhibited by Doris Zurcher, who also was awarded an NCS Bronze Medal Certificate for her efforts. 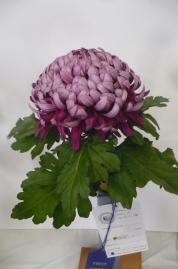 In spite of the vicissitudes of weather, including a small tornado which touched down in her neighborhood, master mum grower Joan Corbisiero won eight trophies, including the following: Best Reflex for Doreen Stratham, Best Decorative for Indian Summer, Best Single/Anemone/Spoon for Purple Light, Best Quill/Spider for Pink Splendor, Best Three-Bloom Entry, Section B for Whiteout, Best NCS Terminal Spray, Section C for Kelvin Mandarin, Best New Introduction for Evan's Dream, and Best Container-Grown Disbud/Spray for Luxor. 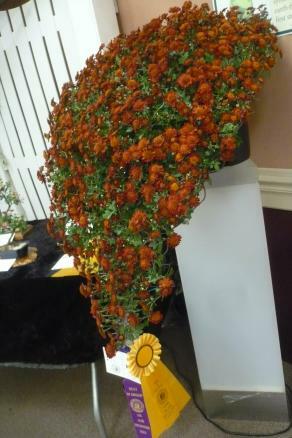 Her Kelvin Mandarin also earned an NCS Bronze Medal Certificate as Best NCS Terminal Spray in Show. Rita Rover and Marty Cohen grew a spectacular cascade of Kurume, which earned them the trophy for Best Tree/Bush/Artistically Trained Plant as well as an NCS Bronze Medal Certificate for Best Container-Grown in Show. Other trophy winners were Jimmy Tan, Best Judge's Entry for Columbus, and John Capobianco, Best Bonsai for Kotoi no Kaori, and Best in Section K, Seedlings and Sports, for his two-year-old bonsai seedling, still only known to the world as RdTC#2S8..
Before the show opens, Rita Rover waters her cascade Kurume. At the close of the show, she accepts her NCS Bronze Medal Certificate from Show Chairperson Joel R. Simon. 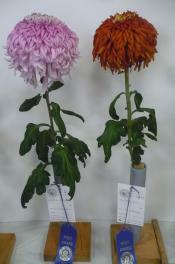 Left: Rita's Gum Drop (anemone) grown in a tree form, was Best in Section. All in all the show was a success, and we hope next year's show is on the same high level of quality but with even more entries. 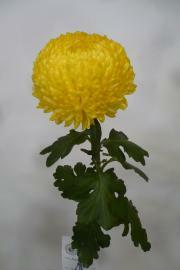 Many members indicated that some of their best mums were not in bloom until after the show, so hopefully having the 2011 show a week later will remedy that problem. 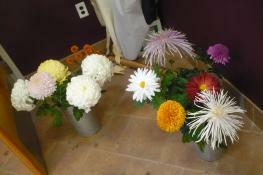 Below are a sampling of more of the 2010 show's entries, fine blooms which earned blue and red ribbons. The show concluded on Sunday afternoon with the awards ceremony. 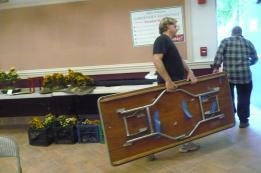 Although it took a day to set up, the show was dismantled in a matter of minutes. 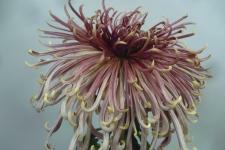 The photos below document the final moments of the 2010 Long Island Chrysanthemum Society show. Most of the photographs on this page were taken by Joel R. Simon with the help of Walter Sokol, and those in which Joel himself appears were taken by Richard Heeseler. In addition to candid photos of various aspects of the show as a whole, we chose to present the top award-winners and a selection of other blue and red ribbon winners representing as many exhibitors as possible. Although Joel double-checked the photos against the 2011 King's Mums catalogue, no doubt there will be misteeks here and there, and Joel will appreciate it if errors are brought to his attention, so this page can be as accurate as possible. 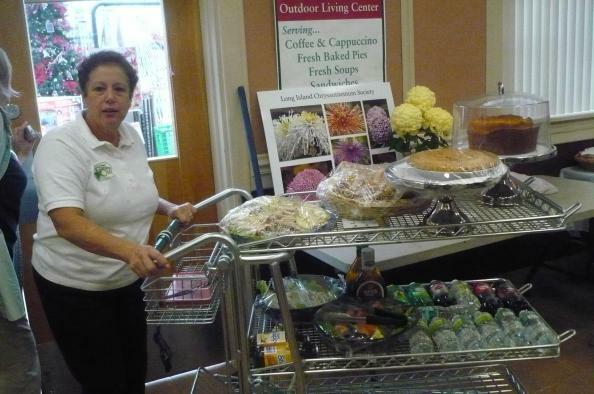 Above: Jackie from the Hicks Gar- den Cafe provided LICS with a del-icious Judges' Breakfast and Lunch on Saturday, 16 October. 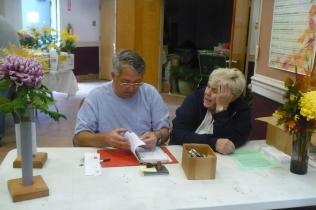 Left: Show Chairman Joel R. Sim-on prepared a bulletin board with a variety of interesting items relating to growing chrysanthemums, the society, etc. In the foreground are some of the blooms in the Judges' Section of the show.